I know it. I've fooled you. I have led all of you to believe that the only things I make are sweet. In fact, you probably even think that the only things that you can bake are desserts. I, myself, began to believe it. I knew that I needed to shake myself out of the pattern, and I thought you'd appreciate a change of pace. For my internship, I spend my days testing recipes. Many, many of them have been biscuit recipes, and all of them have been splendid. Nathalie is incredibly generous, and she has let me contribute a few recipes for her column in the newspaper. The article that she's working on for next week is about CSAs; for those of you who don't know, a CSA is a community of individuals who pledge support to a farm operation where the growers and consumers share the risks and benefits of food production, usually consisting of a system of weekly delivery or pick-up of vegetables and fruit in a vegetable box scheme, sometimes including dairy products and meat. She requested that we develop a few recipes that would employ a number of the vegetables that were in her box. Julia created some lovely pickles and crunchy, addicting kale chips. I decided to make a Thai Cucumber Salad and a pizza. I wanted the pizza to use as many of the vegetables as it could, as my salad only used the cucumbers. 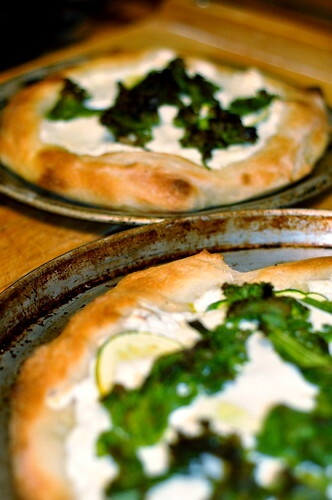 In the end, I decided on a Eggplant, Squash, and Zucchini Pizza with Sauteed Mustard Greens. Oh my lord. I hate to toot my own horn, but boy was this tasty. 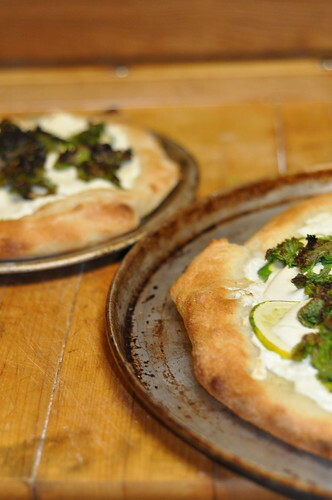 The ricotta base of the pizza was a wonderful partner for the vegetables, which became succulent and sweet in the oven, and the sauteed mustard greens were salty and a bit robust. The mozzarella added structure and tradition, and the little drizzle of homemade garlic basil oil on top really livened things up. This pizza was so good that I made a second batch and proceeded to eat another whole pizza! Preheat oven to 500°. Heat the oil in a skillet over medium-low heat. Add the greens and garlic and sauté over medium-low heat until soft and slightly wilted. Remove from heat and set aside. Prepare pizza crust, as directed, and transfer to a rimless cookie sheet. Drizzle crust with olive oil and sprinkle with salt and pepper. Spread the ricotta over the pizza crust. 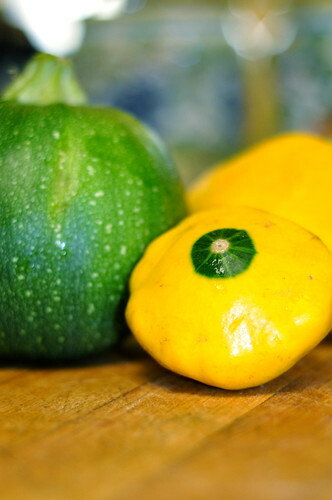 Arrange the eggplant, zucchini, and squash in a single layer on the crust. Arrange the mozzarella slices on top of the vegetables. Place pizza in oven and bake 6 minutes. 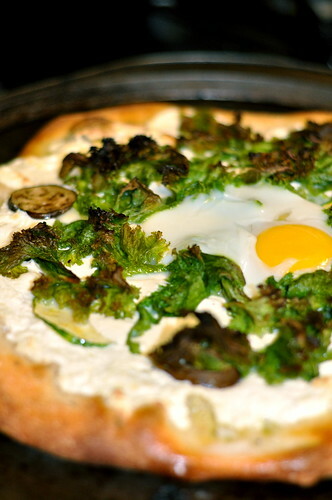 Scatter mustard greens over pizza and crack egg onto the center of pizza, if using. Return to oven for about 6 minutes longer, or until the crust is golden, the cheese is bubbly, and the egg has cooked. Transfer to a cutting board; slice and serve hot. This pizza sounds incredible - you could outdo Monza! yum. i love those fresh, simple pizzas.